Process – Transforming lives. Transforming society. Interested individuals usually engage in written correspondence for some time, then come for one or more visits before requesting a period of residency in one of our communities. After a period of residency, an individual may request the status of a candidate. Candidacy is a time after residency when young men enter into a formal discernment process in order to know the community and its charism better. It is also a time for the community to see if the individual is capable of Assumptionist religious life. Candidacy is a flexible period of time and its length depends on the needs of each individual. Typically it does not exceed a year and it may be much shorter if a person’s prior residency in a community has been significant. During candidacy, individuals engage in studies or apostolic work or a combination of both depending on individual circumstances. Candidates usually pay room and board at this time. 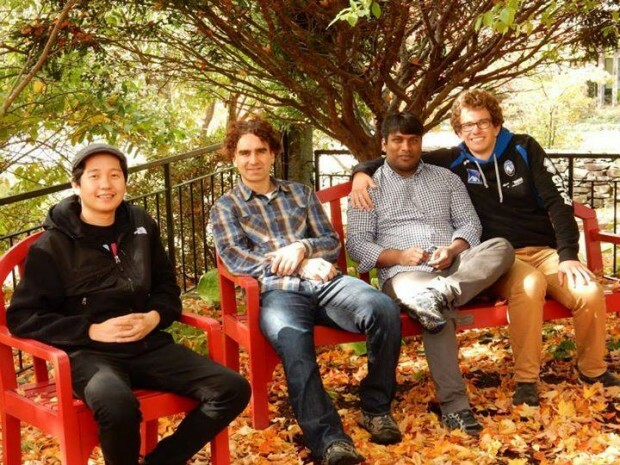 During their postulancy, Brian Verzella and Daniele Caglioni, second and fourth from left, enjoy an autumn outing with Brothers Blair Nuyda, A.A., and Sagar Gundiga, A.A.
After a period of mutual acquaintanceship with the congregation, a candidate may request postulancy, a formal time of preparation for novitiate during which he will intensify his life of prayer, his commitment to the common life, and his knowledge of the Congregation. He will engage in a balanced schedule of prayer, community commitments, study, apostolic involvement, and spiritual direction. Psychological testing is also an element of postulancy, assumed at the expense of the community. Postulancy typically takes place at Emmanuel House on the campus of Assumption College in Worcester, MA. Together, candidacy and postulancy usually last about one year. 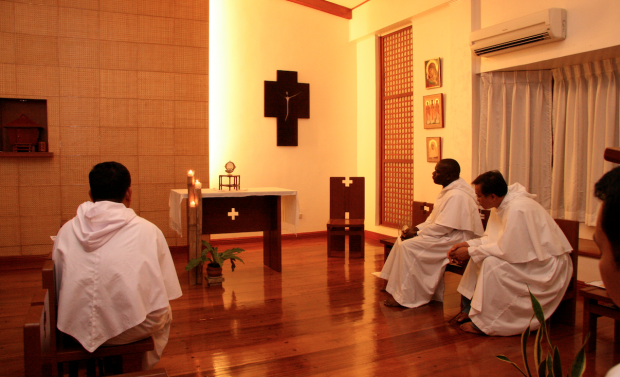 The novitiate is a formal canonical year of formation during which an individual prepares for his first vows within the Congregation. Therefore, it is an intense year of “transformation into Jesus Christ” (to use Fr. d’Alzon’s words), of intense discernment and spiritual direction, of living the evangelical counsels, of completing embracing the common life, of experiencing exterior and interior detachment, and of taking ownership of Fr. d’Alzon’s spirit and his passion for the Kingdom of God as well as of the life, charism, and apostolic project of the Congregation. Currently, the novitiate for the North American Province is located in Manila, the Philippines, where novices live in an international community composed of Americans, Filipinos, Mexicans, Koreans, Vietnamese, and Chinese, depending on the year. You can hear a few of our brothers reflect on the meaning of their novitiate and vows in this video. This period is meant to prepare the newly professed brother, through the common life fully shared, for his definitive commitment before God and within the Congregation. This stage should allow the professed brother to complete his knowledge of Fr. d’Alzon, of St. Augustine, and of the Assumption. It is a period of gradual assimilation into the life of the Province, of the Congregation, and of the Assumption family, into the charism and the mission of the Assumption. If a professed brother has also discerned, with the accord of the Congregation, that he is called to priesthood, he will normally begin his theological studies. Currently Assumptionists pursue their seminary training in Boston either at St. John’s Seminary or Boston College School of Theology and Ministry. The period of temporary vows lasts from three to six years. After professing final vows, a brother called to priesthood will be ordained to the diaconate for approximately one year and subsequently to the priesthood. You can watch Brother Ronald Sibugan, A.A., profess his final vows here. Once a man is in studies, he will have several summers in which to pursue further training for ministry. He may be assigned to pastoral work, or to a community where he may study a foreign language. Because we are an international congregation and often live in communities with Assumptionists from around the world, and because we encourage personnel exchanges between provinces, all young Assumptionists in formation are required to spend a significant period of time abroad, working or studying. You can read about and see pictures from Brother Hoang Nguyen’s recent summer experience back home in Vietnam and Brother Ryan Carlsen’s experience in Romania and Bulgaria.